Both the game-winner and the insurance goal came off the stick of Sasha Chmelevski Sunday afternoon. 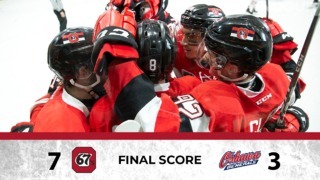 His two goals vaulted the Ottawa 67’s past the Peterborough Petes with a 5-3 victory, and secured the 67’s some insurance over Peterborough in the Ontario Hockey League standings. The game began well for Peterborough, with the visitors scoring first on a high shot by Chris Paquette that solved 67’s starter Olivier Tremblay on the short side at 5:20 of the first period. Shortly thereafter, Ottawa found an equalizer on the power play. Noel Hoefenmayer dished the puck down to Jacob Cascagnette, who found a whole and deposited the game’s tying goal. Ottawa went ahead 2-1 right off the bat in the second period, then appeared to extend their lead to 3-1. However, a video review overturned the goal due to an offside on the zone entry, reverting the score back to 2-1. The Petes then stormed back to a 2-2 tie off a goal from Zach Gallant, and Nikita Korostelev took the lead for the Petes at 18:20 of the second. However, Chmelevski’s heroics late in the game were enough, as he notched his 24th and 25th goals of the season to give the 67’s a victory. 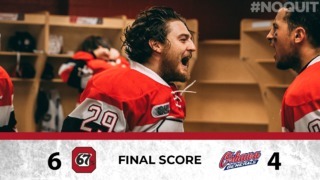 The victory extends the 67’s point streak to six games –they have either won or lost in extra time for all of those contests. 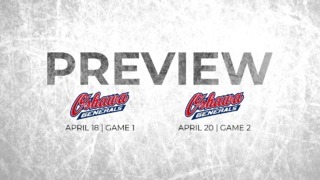 The 67’s now have an eight point lead on Peterborough in the OHL’s eastern conference standings and sit in seventh. 67’s F Sasha Chmelevski leads the 67’s in points with 49 in 50 games, and his two goals put him four up on 67’s F Austen Keating for the team lead. 67’s outshot the Petes 34-30 in the contest, including a 17-8 advantage in the first period.